Made a new character who is some manner of follower or priest of Kormir. Have yet to work that out fully. I tried to match the color scheme to Kormir/the Sunspears to get that nice and shiny holy look, in any case. Everyone uses Carapace Leggings, I know, but I couldn't resist...they are just too nice looking! Armor pieces are: Protector's Shoulderplates, Phalanx Heavy Warplate, Phalanx Heavy Gauntlets, Carapace Leggings, and Paws of Koda. 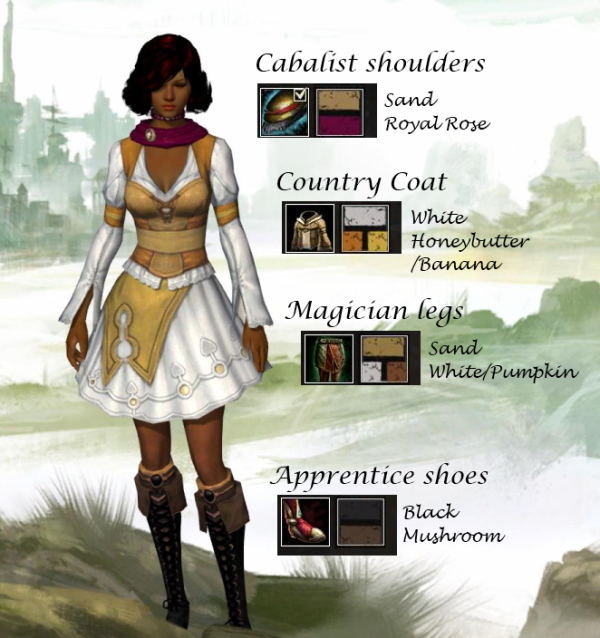 Dyes are: White, Gold, Perseverance, Antigue Gold, Taupe, and Deep Glacial Sky (the little glass orbs that are barely visible on the leggings anyway). Since I'm going away on an adventourus vacation to foreign shores, I gave Sal nice "travelling look" as well. Happy with the result! Here are some recent pics of my many characters (or some of them at least). 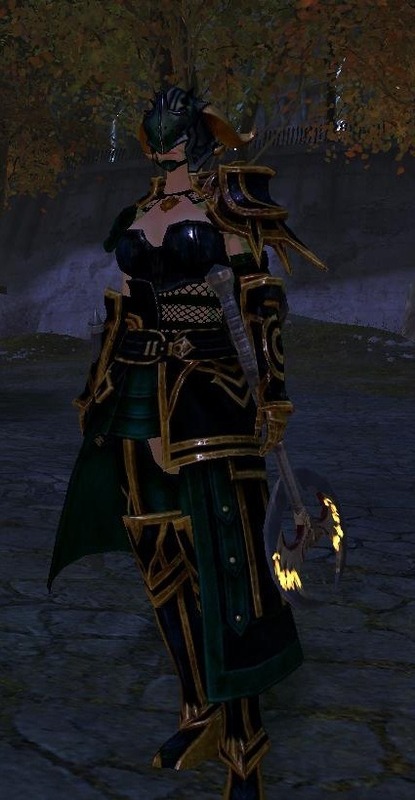 Here is another of my main Areeza. Also secret picture below. Only for those bold enough! 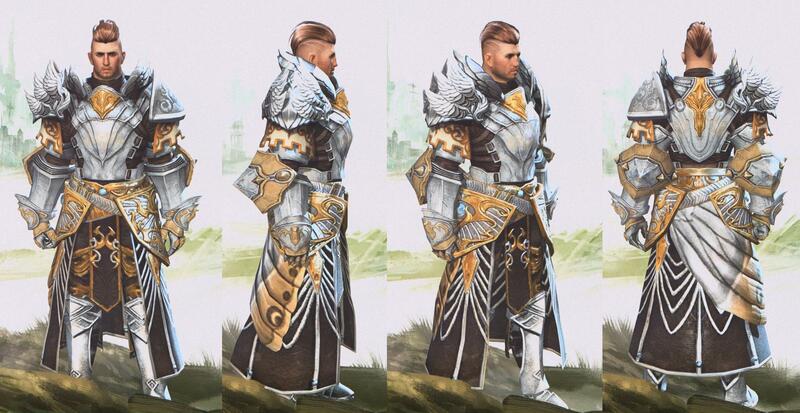 This so that others can Shamelessly rip of and steal everything that makes your character unique for their own nefarious ends be inspired by your personal touch and taste in fashion. Thought I'd post it up, because it does look cool. Shoulders, gloves, leggings and boots are all Vigil armour. Using Antique Gold, Emerald and Midnight Ice. Chest piece is Scallywag with Midnight Ice and Antique Gold. Head pice is right eye patch, using Emerald. Her axes are Phoenix Reborn (for the right hand) and Truth (for the left hand). And an alternate head piece. Barbaric helm, with Emerald, Antique Gold and Midnight Ice. Nothing particular fancy here, Kyra being just a simple Krytan country girl. So this is my engineer. 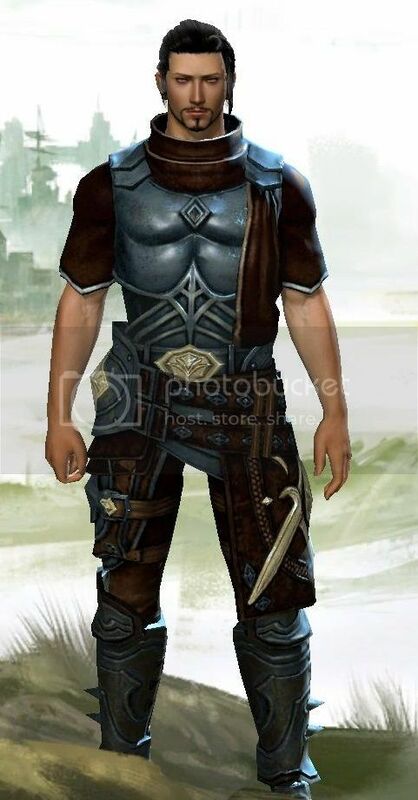 I wanted to find something in leather that sort-of resembled a metal suit (not necessarily plate armor, but more something he'd cobbled together on his own). I think I succeeded. It also looks pretty good without the shoulders. 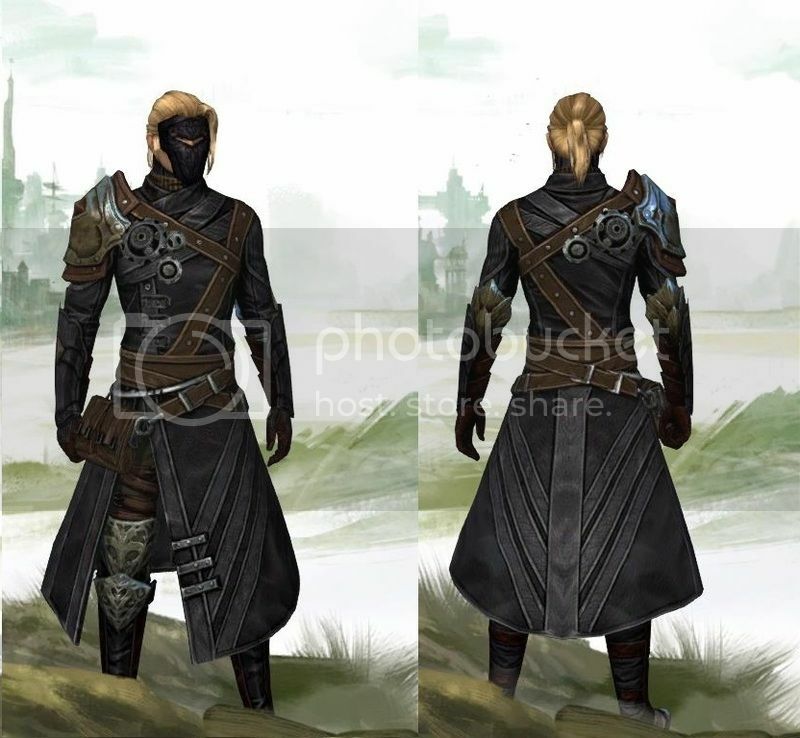 The pieces are: Leather Mask, Carapace Shoulders, Trapper Coat (Charr Tier 3 Cultural), Carapace Leggings, and Drover Boots (Charr Tier 1 Cultural).